Harold has the chocolate hearts for you. Here we go! One box of chocolate hearts for you. Who’s the lucky one this time? Lance? Oh, so you’re delivering it for a friend. Right, I’ve heard that one before! Objectives: Give the hearts to Lance. I’m sure Lance will be surprised to get a gift in return. What’s this? Do you have chocolate for me? From whom? Who could it be…? Are they from Mary? Do I dare hope that? You’re so mysterious. But whoever the secret admirer is I want to write a love letter to Mary. So there! But how do you write a fine love letter? Can you help me? Objectives: Help Lance to write a love letter to Mary. Same way all love letters start; with something about roses. “Roses are red, violets are blue, if I invite you to a date, will you say I do?” Cool, Rita! I really hope she wants to go on a date with me. It’s a bit embarrassing to confess, but I would never have done this without your help. Now let’s go see how the trainee is doing with the cement. Ok, I don’t think I’m very good at this concrete work. I poured out the cement powder everywhere but nothing happened. Then I remembered that you also need water! The class on cement at G.E.D. was only one morning and I didn’t really get the best grade… hehe. Can you see if you can find some water? A LOT of water? For this amount of water we need enough water to fill a swimming pool… Or maybe even more. How should we do it? I have no idea. But I’m sure you will think of something! Objectives: Find someone who can help you get a huge amount of water into the wine cellar. Someone at the winery must have a good idea as to how it could be done. Hmm, maybe someone like Carney? Hello Rita. If you can get a swimming pool of water into the cellar? Hypothetically you could. How? You will need to do the first two quests before the third one can be done. You can do the first two in either order you like, but they must be completed before the third one can be done. One thing that would need to be done is to make sure the watering system isn’t getting more water. If that happened the pressure would become explosive in the cellar. How to turn of the watering system? The watering system gets its water from three different sources you would need to close. You can do this by closing the three different valves there, there and over there. See? But there is no real reason to do it… So I’m not sure why you are asking. You want to take a closer look there at those valves? Sure, why not? Objectives: Turn the three valves to stop the water and then speak with Carney again. The three valves are in each of the front fields, east of the Manor. When you have shut off all three of them, return to Carney. Hello. I saw that you were gone a while and I looked at those valves I showed you. You are sure you didn’t touch anything? Hmmm… It looked like the watering system had been shut off. But it doesn’t matter. As long as the drainage isn’t plugged and the pump isn’t going too fast, it shouldn’t be a problem. And what are the chances of those three things would happen at the same time? The drainage system? Yes, sometimes it plugs. For some reason the drains from the stable also run through the same system. A bunch of hay does a great job of plugging the system completely every now and then. Hay is very effective at causing stoppages. Where the drain is? Down from the winery but above the riding arena if you want a look at it. Objectives: Take hay from the barn and plug up the drain below the winery. The drain is below and behind the winery main building on the cliff above the riding area. Grab some hay from the bale by the stable. To get to the drainage pipe, go under the little bridge going to the riding arena. Continue along outside the winery until you are about directly west of the winery building. The pipe is really big, set into the side of the hill, and hard to miss. You have to be dismounted to use the hay. When you are done with your mischief, go back to Carney. Was the drain pipe interesting? There was some hay in it? Of course, as long as it isn’t completely stopped and nobody increases the speed of the pump there shouldn’t be a problem. The chances of that happening are smaller than the sun not coming up tomorrow, so don’t worry about it. The pump in the cellar? The pump is in the boiler room. It is a very advanced pump. It is impossible to increase and decrease the pump speed by just hitting a couple buttons. When all the gauges are red the pump is at its maximum speed. It is quite hard to get it to max out in normal conditions. I lost the manual a long time ago but it doesn’t matter. What would you want with that? Objectives: Go to the pump in the cellar and try to get it up to maximum speed. The boiler room is across the main hall from the room the trainee is in. The goal is to get the screen filled up with the red squares by clicking different combinations of the green buttons. The red button will set the squares back down to one. I did this part several times to test it. It does not matter what order you press the green buttons as long as you press them all at least once. You could go across the line and press them all in order. It will not work though if you have not done the previous two quests. When you have gotten them all red, go back to Carney. Hmmm… Does it sound like the pump is running faster than normal? But it shouldn’t matter. As long as the watering system is shut off and the drainage isn’t plugged, it should be fine. And really… What are the chances that will ever happen? The emergency system for fast watering during drought? Yes, it is the pride of the winery! When things get their hottest in the summer months we need extra watering sometimes. Then I just press this button here and we get as much water as the Silversong river in a minute! You want to try it? Sure, why not? What could possibly go wrong? Push the button behind me and you’ll get to see something special. Objectives: Push the button by Carney to start the super watering system. Oh no. How am I going to explain this to the Baroness… Rita, you’ll have to excuse me. I need to go take care of this problem. Go see the trainee in the cellar about the water. So much water, did you see? Did you do this? That was really smart! Objectives: Speak with the trainee again. Why, yes I did do this. Impressed? This should do the trick but it will definitely take at least a day for the cement to cure. We’ll see you tomorrow. Return to the trainee tomorrow. Lance in Silverglade Village needs your help with something extremely urgent. Lance will tell you about his urgent problem. Ride and speak with Tyra at the Silverglade Equestrian Center. Hey! No, I haven’t been there for a while. Perhaps it was Judy? Hello Rita! Hello Rita! 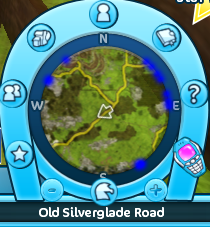 I was thinking I should go to Silverglade Village but I changed my mind and went to Firgrove instead. I realized that I haven’t seen Felicity for a long time, so when I went shopping I did that in Firgrove. But have you talked to Pauline? She said something about a neat sweater in Silverglade Village. Ride to Pauline down by the grape fields, and ask her if she’s been to Silverglade Village recently. No, I didn’t buy a sweater. I decided to save my money instead, but I think my sister Mary visited the tailor yesterday afternoon. She had to give him some wool. Why don’t you ride out to Mary and ask her yourself. Objectives: Ride and talk to Mary. Go see Mary at Doyle’s Abbey, just north of Fort Pinta. Hi, it’s nice to have some company. It’s usually so lonely here. Yes, that’s right. I was in Silverglade Village yesterday afternoon and handed over some wool to the tailor. Why do you ask? Objectives: Come up with a white lie so you don’t betray Lance. Oh, you’re doing a survey about the visitors in Silverglade Village. Glad I could help! While you’re here, Rita, can you help me with something? It’s a secret so you have to promise to not tell anyone. It’s super important that you’re quiet as a mouse and don’t reveal this! Objectives: Listen to what Mary has to say. When I was in the village I saw a cute boy who said hello to me. I knew it was love at first sight, at least for me. I don’t dare tell hi but I thought that maybe you could give him something from me, secretly? Ride back to Silverglade Village and tell Lance what you’ve found out. How did it go? Did you find the girl? She’s so cute! Her name’s Mary? I have to admit, Rita… I’m a little bit in love with her. I’d like to give her something, but in secret. Jelly hearts! That’s never wrong! Can you help me get hearts at the baker’s and give to Mary? But don’t tell her they’re from me. Objectives: Get jelly hearts from the baker. Speak with Harold about getting those jelly hearts. Do you want jelly hearts? I also want that but it could be difficult. The whole delivery of jelly hearts for my shop went bust! The package ripped on the way here, so now you can find jelly hearts all over Everwind Fields. If you need any jelly hearts you have to ride and pick up as many as you want. Objectives: Pick up ten jelly hearts and give them to Mary. Ride north out of Silverglade Village to the Everwind Fields and pick up the jelly hearts. When you have picked up ten of them, take them to Mary at Doyle’s Abbey. What, a gift for me? From whom? A secret admirer. Oh, so exciting! Tyra needs your help up at the Winery. Hello Rita. Can you help me with something? Please? You see, the Baroness wants me to get a bottle of her finest wine from the wine cellar. She is going to serve her finest wine next weekend at her dinner with the Councilman. So I went down in the wine cellar and started to look for the bottle. Suddenly I heard a horrible noise and the whole ground started to shake! I was so frightened that I just dropped everything and ran out of there. I don’t want to go in there again but the Baroness is going to be angry if I don’t do what I’m told. Can you get the bottle for me? The wine cellar is at the other end of the winery. There is a door to it in the factory building behind the stores. Objectives: Go down in the vineyard wine cellar and get the bottle of wine for the Baroness. The wine cellar is at the other end of the winery and there is a door behind the shops. Ride north from Tyra, past the manor. The door to the cellar is on the east side of the winery building. Once in the cellar, go down the stairs and turn left into the first door, then go right into the next room, to get the wine. Watch out for ghosts on the way down! Wait! Don’t go! Let me tell you all about it. This is how it is. Today is my first day as a trainee at G.E.D. by North Link and the first thing they did was show me their new drilling machine. Here is your new job they said, just drive it straight. Then they said good luck and walked off to drink more coffee. So I figured I’d better do what they tell me to… But it seems like I drove the machine a little crooked. If the boss finds out I’ll get fired right away. I’m so unlucky. What should I do now? I have no idea. This is so embarrassing. Can you help me get out of this fix I’m in? I know exactly how you feel, dude. Getting poor training and you muff everything up on your first day. Which Bottle is the Right One for the Baroness? You can’t come up with anything? Please, try and think of something. Please! A bottle of wine? Yes, there is a bottle on the shelf here beside me of the finest Chateau Silverglade 1955, it has a complex taste with an excellent bouquet and a strong finish. An excellent choice for a formal meal. How do I know? Both my mother and father were sommeliers so I’ve been learning about wine since I could crawl. You are going to take the wine to the Baroness so that she won’t come down and look around here? Ok, but don’t leave me in the lurch. Co back as soon as you can. Objectives: Take the bottle from the shelf by the trainee and deliver it to the Baroness. Pick up the bottle behind the trainee and take it back outside to the Baroness. And in case you were wondering, a sommelier is a wine steward; someone who is knowledgeable about many different wines and their tastes. They often work at high-end restaurants, and probably have more class than your average bartender. Also, let’s hope he learned that info about wine from his parents, because he looks too young to drink. How about that, that is the bottle I was looking for last week. Ah, from 1955. I didn’t know you were a wine expert Rita. But normally the staff is very dependable. But this took strangely long time. You are an orderly girl Rita, how could it take so long? Of course it is probably my own fault. It has been years since I have been down in the wine cellar… It must be very disorganize down there by now. I think it would be for the best if I went down there and looked into it myself. Rita, let’s go down and take a look right now. What’s that? There is a wasp nest on the cellar stairs? Would you do me a favor and get rid of it? I’m allergic to bees you know. Objectives: Go down into the wine cellar again and speak with the trainee. Go down to ‘get rid of the bees’ and warn the trainee that the Baroness is coming. Oh no! The Baroness is on her way here? She’s not going to be happy when she sees what I’ve done. What are we going to do? What? Block the door with barrels? I’m not sure I understand but I’ll trust you. Don’t shut me in here. I promise I won’t make a sound. I’ll be quiet as a mouse! Objectives: Pick up the barrels in the cellar and block the door with them. Then speak with the Baroness again. Pick up the barrels, then go outside the room to place them. Once they are all up, go out of the cellar and speak with the Baroness. Hello young lady. Is the wasp nest gone now? Excellent. Meet me in the wine cellar as soon as you can. The Baroness is now down in the cellar in front of the room you just blocked off. Go down in the cellar to speak with her again. It is overflowing with wine in the cellar! How could we fill up the cellar all the way up to the door? It has been a good couple of years now but I didn’t know it had been this good. We need to expand the cellar! Can you take care of this development Rita? Great! Can you see to it that the cellar gets renovated? I promise you will be well compensated for your efforts. Were agreed then! Let me know when you are done. It will be so exciting to see the new cellar. Work quickly dear. Objectives: Move the barrels again and speak with the trainee. With the Baroness safely out of sight, take down the barrels and speak with the trainee. Oh no! How are we going to fix this Rita? I’m not good at this kind of thing… Digging a hole and then filling it back in… But for this I think concrete would do the trick. I know there is tons of it up at North Link. But I’m sure you will come up with something… You are as smart as a Nobel Prize winner. Maybe you can find a way to fool the boss up there. Objectives: Ride to North Link and find some concrete. The boss should know something. Ride up to the North Link construction site and speak with the crew lead there. Concrete? Listen up, don’t go thinking we just give out concrete to anyone who asks for it. Anyways, we don’t have an concrete right now. The last delivery has gotten lost on its way here. Whew. Can you believe it. The guy who drove the truck sent an SMS saying he was driving around Jorvik and doesn’t know where he is I have no idea where he could be… Can you figure out what his message is supposed to mean? I don’t really get what he is trying to say… and I have a lot of other things to do. Maybe you can find him and give him directions to here? Great. I’ll SMS him and say you will be coming to find him. Objectives: Find the lost concrete truck. I am aware the clue to the truck is confusing. I have contacted game support to change it but have not heard back from them yet, as of writing this. The truck is to the west of the castle. It is on the road south of the Winery. Here is a map of its exact location. It is a big giant yellow dump truck, and hard to miss as long as you are on the correct road. What’s up? Is it you who is going to show me the way to the building site? I have tons of cement I need to get rid of. Where should I take it? I don’t really know. The directions I got are worthless. So you have directions to the build site? To the farm up there? To a factory by the farm? That is very close to here. Excellent! Ok. I’ll drive there and unload the concrete in the cellar. No problem. Great, we’ll see you at the Winery then! Objectives: Ride and meet the driver with the cement delivery by the factory at the Winery. Go up to the factory building. The truck will be parked in front of it. Speak to the truck driver when you get there. It’s funny how he magically disappears as soon as you turn your back to him. Hello there! I took a bit of a roundabout way here but it got me here before you anyways. They don’t call me Lightning for nothing! Ok, so we are all set to unload the concrete now. This is going to take a while so you might as well come back tomorrow. You can trust old Lightning. Cheers! We’ll see you tomorrow. Return to the Truck Driver tomorrow.